The Bible states that there is a self that people have which needs to be done away with. There is a new self which replaces it. What is the nature of the old self? It is sometimes associated in scripture with the term ‘sarx’ or ‘flesh’. It is a self which is focused on this world as its priority. Although this world is a priority to God, it is not the top priority. We keep our minds fixed on things above, and then we come down to earth with a heavenly attitude. Unfortunately many people who call themselves Christians get wrapped up in the affairs of this world and lose a heavenly perspective. The old self lacks confidence and courage, because eternal security comes only to the new self. The old self demands attention but deserves none. The new self lies obscured under the rotting flesh that hides it. Consider yourself dead to sin and alive to God in Jesus Christ. Dear father, I wrestle with the false self. I often think that I am defined by my emotions but when I work against my fears and pain, I find that I am called to a life set apart for you. Give me the courage to be your version of me. How does the passage describe the old self? What does it have to say about the new self? 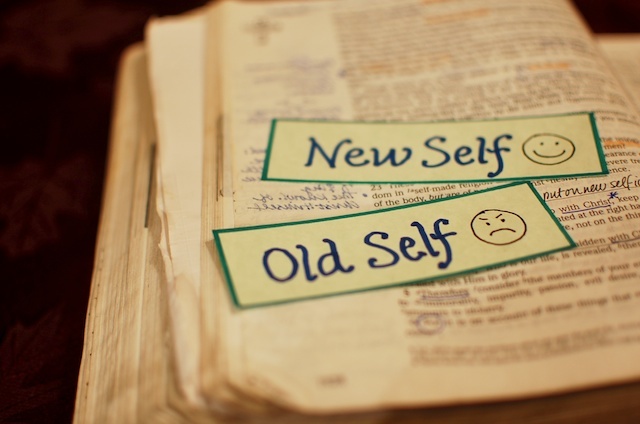 Why does Paul want believers to know the difference between old and new self? How would you describe your problems with the old self? What new self qualities would you exhibit more as you died to the old self? The old self is described as a body of sin that needs to be crucified into nothing. Dead to sin, shared in Christ’s death, and alive in Christ by sharing in his Resurrection. The difference is that the new life is free from sin and is totally set apart for God. I wrestle with the false self..
One time, my friend told me that I always try to be a nice person. She didn’t believe that it was the true me. She always doubted and didn’t like the fact that I was never mean to her. It was hard…but then she made me think deeply about myself. Who am I? What am I? Why am I acting this way? Maybe my environment made me who I am today. Maybe my parents and my sister made who I am today. This is what I thought. My problem with the old self is that I tend to look more around what’s around me and how they have influenced me. I still struggle with the false self. I was, is, and will be influenced by God, my Living Father. Prayer: Lord, give me the courage to be more like you. To defeat my old self. My old self….it gets in the way even still because I resort to not trusting God with everything, especially my emotions. I care too much of what other people say, think and how they relate emotionally to me. I know that this is redeemed in my new self, but silly me, I forget I am being made new and Jesus calls me to rid of my old sin nature, because it has no power over me. How incredibly different my life can look when I remember I am a new person, and I lay those sins at the feet of Jesus. This passage is so freeing to me. Sin no longer has mastery over me. While I am not perfect, by the power of the Holy Spirit I am able to say yes to God and no to sin. Lord, please make me into who you want me to be. Help me to remember that sin does not rule me, and that You are my master. Give me strength in the face of temptation to look to You and be reminded who You have created me . Thank you for being my Lord! The old self was crucified. It was the part that was enslaved to sin. And now we are to consider ourselves as Christ is, dead to sin and alive to God. The problem is that the old self has not completely disappeared. I have been finding that my fear and laziness are ways that my old self is getting in the way. I would expect that the person who is dying more to the old self would not be as afraid. I would expect that person to be more passionate. I’ve been thinking about the old self versus new self lately. A book I am reading for Apologetics talks about God re-creating us, and in church this morning the pastor spoke about God working in and through us. There is a tension in the now and not yet. God is working in me, but I still wrestle with sin. He is re-creating me, and I long for the day when the old self will be completely put aside in Heaven. Lord, continue Your work in me. I need You. It is really interesting to think about the old self and the new self. I like the image of the old self lacking confidence and courage because it is only in the new self that we can gain eternal security. This passage has always been a struggle for me. It is one thing to understand that we have died to our old selves and are made new, but it seems so much harder to act upon this principle. It can be so easy to live like our old selves, but it is only through Christ that we can be truly free. I am so thankful that my old self does not reign in my life. Because of Christ, I have the power to overcome the sinful desires of my old self and live a life that is pleasing to the Lord. Crucified is such a powerful word, and it provides such a beautiful image of what happened to our old self. Father, thank you for giving us new life. Thank you that your idea of salvation wasn’t to leave us where we were and to one day save us from that state. While we still are susceptible to sin, it does not rule over us. God, your Word says that we are new creations in You. Help us to understand that reality greater and live it out more and more with each passing moment. Thank you that you play a vital role in our sanctification and forgive us when we fall short of your perfect standard. In Jesus’ name, amen. 1. The old self is defined as being crucified with Christ. 2. The new self is described as being united with Christ and set free from sin. 3. Paul wants people to understand that they are no longer bound to sin and can live in the freedom of being a new self, united with Christ. 4. My old self was very concerned with fitting in and being seen as cool by my peers. I often fell into sin that my friends were doing because I wanted to be like them. 5. Through dying to my old self, I can now exhibit more confidence in who I am as a Christian and Jesus follower, no matter what others think or do. 1. The old self which was enslaved to sin is crucified with Christ. 2. The new self is dead to sin and alive to God. 3. When you have a change of identity you need to recognize that change to be able to act out of and live in that new identity, otherwise you would be so easily confused and it is already confusing enough. 4. My old self struggled and I still struggle with the need to be perfect and to know but it is both only God’s to be perfect and to know. 5. I exhibit more trust in the Lord than I used to, certainly not well or consistent, but it is better.